Chaplains, from left, retired Air Force Brig. 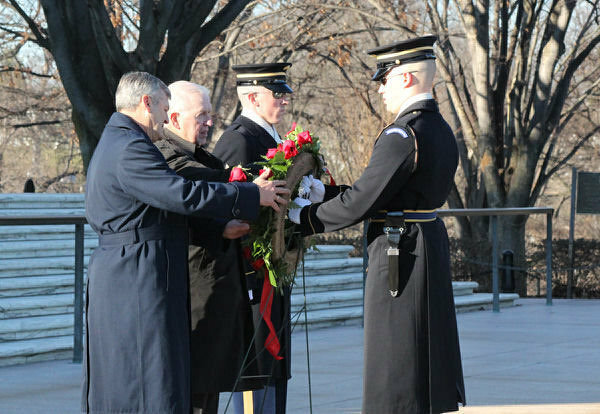 Gen. David H. Cyr, and retired Army Col. John Schumacher, Sentinel, and Sergeant of the Guard place a wreath at theTomb of the Unknowns last month. John Schumacher, the retired Grace Brethren Army chaplain who now serves as Endorsing Agent for the Fellowship of Grace Brethren Churches, was recently recognized at the Tomb of the Unknowns in Arlington National Cemetery. Chaplain (Colonel) Schumacher served in the U.S. Army for 30 years, including two tours in Vietnam. Below is a portion of a story about the event, along with an account of how chaplains learn to deal with death. Click here to read the complete story. ARLINGTON, VA. — Seated at a table with other chaplains who have comforted grieving military families, retired Army Chaplain John Schumacher held the red rose in his hands before he passed it along, pausing to remember those who had died on the battlefield. Schumacher then took the rose and added it to a memorial wreath. Two days later, he and another chaplain placed the wreath at the Tomb of the Unknowns in Arlington National Cemetery. Last month’s memorial ceremony, organized for the first time by the National Association of Evangelicals Chaplains Commission, gave chaplains, who usually help others grieve, a chance to grieve themselves. This often-unspoken need is now being addressed across the country, with new training and a greater emphasis on mentoring. As these initiatives take hold, chaplains working in hospitals, hospice and the military are finding ways to cope.